Summit Appliance Ducted, Ductless and Convertible Range Hoods with two-speed fan, switchable light, and a combination aluminum-charcoal filter. SUMMIT range hoods are made in the USA. Range hood prices start at $199.00 and up. Available in 20", 24", 30", 36", 42" and 48" sizes. Range Hoods shown on this page offer features all customers want including the convenience of top or rear venting and four finish options. 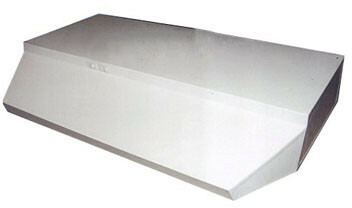 SUMMIT "ULT" series 425 CFM range hoods are exclusive items offered by summit. Model ULT2824SS is a contemporary style, 24 inches wide range hood, with a stainless steel finish. It's a convertible hood, fully equipped with full washable aluminum filters and operates at variable speeds. Our ultra series is the best bet if you are in the market for quality hoods at value prices. SUMMIT H1620B is a 20 inch wide range hood, part of a series of quality convertible range hoods. SUMMIT H1620Q is a 20 inch wide range hood, part of a series of quality convertible range hoods. SUMMIT H1620SS is a 20 inch wide range hood, part of a series of quality convertible range hoods. SUMMIT H1620B is a 24 inch wide range hood, part of a series of quality convertible range hoods. SUMMIT H1620Q is a 24 inch wide range hood, part of a series of quality convertible range hoods. SUMMIT H1624SS is a 24 inch wide range hood, part of a series of quality convertible range hoods. SUMMIT H1624W is a 24 inch wide range hood, part of a series of quality convertible range hoods. SUMMIT H1630B is a 30 inch wide range, part of a series of quality convertible range hoods. SUMMIT H1630Q is a 30 inch wide range hood, part of a series of quality convertible range hoods. SUMMIT H1630SS is a 30 inch wide range hood, part of a series of quality convertible range hoods. SUMMIT H1624W is a 30 inch wide range hood, part of a series of quality convertible range hoods. SUMMIT H1636B is a 36 inch wide range hood, part of a series of quality convertible range hoods. SUMMIT H1636Q is a 36 inch wide range hood, part of a series of quality convertible range hoods. SUMMIT H1636SS is a 36 inch wide range hood, part of a series of quality convertible range hoods. SUMMIT H1636W is a 36 inch wide range hood, part of a series of quality convertible range hoods. SUMMIT H1642SS is a 42 inch wide range hood, part of a series of quality convertible range hoods. These offer features all customers want including the convenience of top or rear venting and switchable lights. SUMMIT H1648SS is a 48 inch wide range hood, part of a series of quality convertible range hoods. These offer features all customers want including the convenience of top or rear venting and switchable lights. SUMMIT H1720B is a 20 inch wide range hood, part of a series of quality ductless range hoods. SUMMIT H1720Q is a 20 inch wide range hood, part of a series of quality ductless range hoods. SUMMIT H1720SS is a 20 inch wide range hood, part of a series of quality ductless range hoods. SUMMIT H1720W is a 20 inch wide range hood, part of a series of quality ductless range hoods. SUMMIT H1724B is a 24 inch wide range hood, part of a series of quality ductless range hoods. SUMMIT H1724Q is a 24 inch wide range hood, part of a series of quality ductless range hoods. SUMMIT H1724SS is a 24 inch wide range hood, part of a series of quality ductless range hoods. SUMMIT H1724W is a 24 inch wide range hood, part of a series of quality ductless range hoods. SUMMIT H1730B is a 30 inch wide range hood, part of a series of quality ductless range hoods. Summit H1730 30" Range Hood With 180 CFM Interior Blower And 2 Fan Speeds. These hoods are ductless (recirculating), ready to install, and offer features our customers need including a two-speed fan, a switchable light and aluminum-charcoal filter. All SUMMIT 1700 series hoods are offered ins 20, 24, 30, and 36, inch widths to accommodate the smallest to the largest kitchens. Other sizes can be specially ordered (minimums apply). H1700 series hoods are stocked in white, black, bisque and stainless steel. All SUMMIT hoods are made in the USA. SUMMIT H1736B is a 36 inch wide range hood, part of a series of quality ductless range hoods. SUMMIT H1736Q is a 36 inch wide range hood, part of a series of quality ductless range hoods. SUMMIT H1736SS is a 36 inch wide range hood, part of a series of quality ductless range hoods. SUMMIT H1736W is a 36 inch wide range hood, part of a series of quality ductless range hoods. Generally In stock & ship in 1-2 days!